I find that I constantly strive to get everything into a sketch. 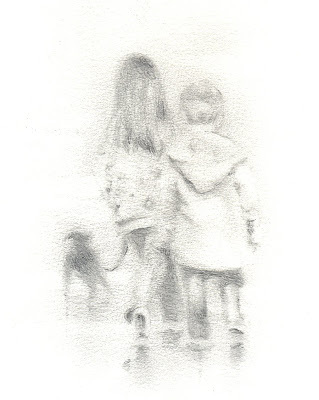 I took the children and that darned dog, Fudge out in the fog and the wet - I was determined to try and sketch from some photos I took and resist putting the detail in - nearly killed me! I got a toy for Christmas! I have a new scanner - no longer shall I have to scan on my old machine, drop it onto a floppy disk ( yes I know sooo eighties), upload onto new computer and format in photoshop. This is a painting using acrylic paint on a piece of wood that I found. I painted this when Beth was four, she was creative then and will always be I guess. I found this picture by accident and it occured to me, it is part of the thread that runs through my work - should have been a teacher! 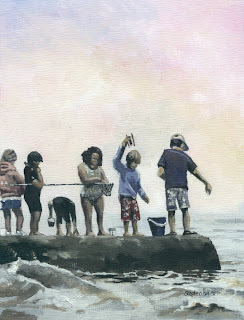 I finally got round to painting the children on the jetty catching crabs. It was strange to do a warm painting after all that snow! It is timely though, I'm going back to Runswick Bay this weekend, staying in a cottage with friends. Wine and log fires, nice. Sarah and I went Christmas shopping on Friday. Not the usual pushing and jostling and irate people in queues and surly shop assistants. There was an air of calm and - wait for it - I actually enjoyed myself!! 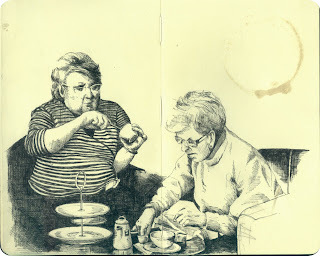 We stopped off for a coffee and these two wonderful ladies were enjoying an afternoon tea and scones, how lovely. 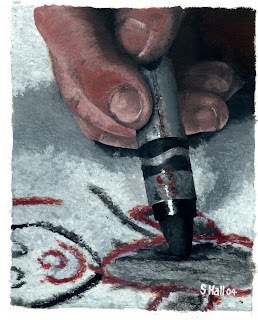 I 'm updating my blog because I feel like a fraud - I sneaked a photo with my phone and worked on that at home. It's pen and ink in my moley, took me a couple of hours I wish i could draw that fast! I've just finished a commission for Rebecca. It's acrylic on canvas 36"x24". I took the red letter box idea from my previous post to add a dash of colour. Hope she likes it! It's been snowing here in Lincoln, but not like this!! 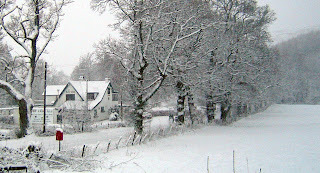 I took this photo outside a cottage we stayed in over the New Year o5/06. The pub brews it's own beer and is fab! The drive up to Scotland took an eternity, the weather got worse and worse. We put the car on the drive and it didn't move for three days. We built snowmen walked in the mountains, obviously walked over to the pub, we were worried about their customers not getting through so it was more of a public service really :-) and staggered and slipped back! Happy but chilly times! I miss the talent of Johnny Cash. 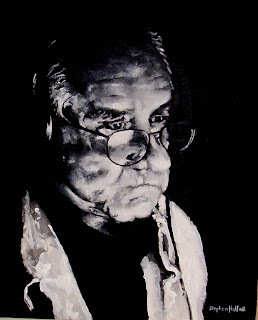 I found a series of photos of him in his later years, this painting is mine. I'll never part with it, it's my homage to a real talent (profuse apologies to the photographer who took it), I painted this when I had a really bad day and today was another one. They happen, but it's what you do tomorrow, and tomorrow is going to be awesome! Yay!